These are my entries for the alphabet challenge proposed by Judy Horton, to begin June 3 and proceed with weekly entries. When I have alternate choices for a given letter, I'll include them here as well. My captions are designed so the gallery can be sorted alphabetically. My intent is to have each entry be something from the worlds of art or archaeology (either an artifact or an archaeological site). It is also my intent to represent as many different sources (museums, venues, etc.) as possible. Not every picture will be recently taken, but for the most part each entry will be newly processed specifically for this challenge. I'm trying an experiment this week. Instead of waiting until this coming Sunday to release my various letter P entries to the alphabet challenge, I'm going to send them out over the course of the week. This is one of my Tuesday, September 11, choices. Other challenge entries for the letter P, namely 'Poet' for Tuesday and 'Pterodactyls' for Monday (and all earlier entries) can be seen in the same parent gallery 'ABC Challenge begun 2018', link below caption and keywords. Plaster originals in scaled-down size for two of Marshall Fredericks relief carvings meant for installation of building exteriors (probably as carved stone). On the left is Fredericks’ interpretation of a Pony Express rider on a rearing horse. It is paired in the exhibit with an Indian on a similarly rearing horse (incorporated into my ‘Native American’ montage). 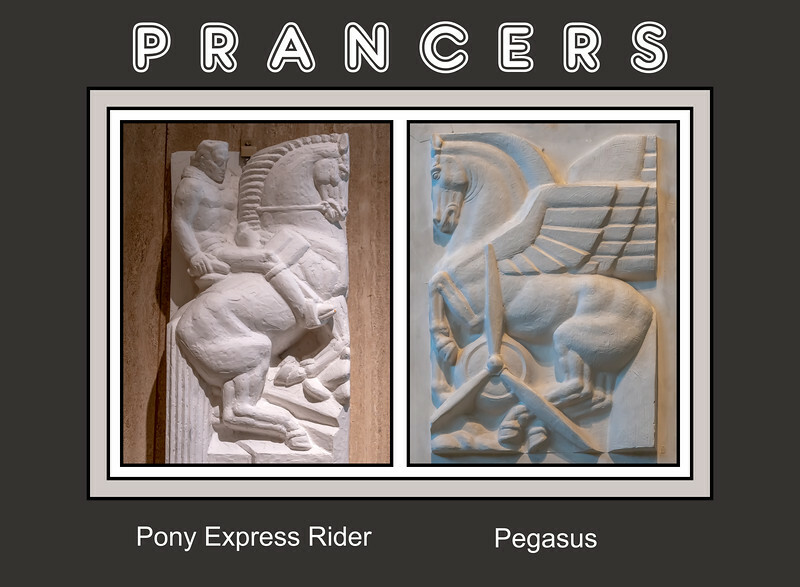 On the right is one of Fredericks’ takes on the mythological winged horse Pegasus. Note how similar it is in general posture to the other horse. Before you ask, IHNC why Fredericks included an airplane engine nacelle and propeller in this carving. The individual photos and the montage itself (created in September 2018) are copyrighted by Elizabeth Jean Jacob, with all rights reserved. Wow! Your "P's" are so superior to mine that I will post Sunday! Love this! Thanks for all your recent support of my photos, old and new. Chosen for your enjoyment. Comments and constructive criticism are always welcome and appreciated for the spirit in which they are offered.